Read the Entire PDF Here! Thanks to our supporters and funders. 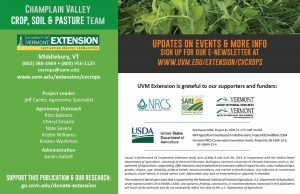 This newsletter is edited and managed by Kristin Williams, with copyediting and design assistance from the UVM Extension Media Team. Our Fall 2017 Newsletter is out! View it HERE. Focusing on Agriculture in the Champlain Valley and Beyond By Jeff Carter. This season’s challenges and ways to move forward. News, Events & Info You Should Know Agricultural Conservation Highlights Tour; NMP Updates; Mock Inspections; Business and Ag Support for You; New Grazing Class; No-Till and Cover Crop Symposium. What Do I Do Now? RMA Update By Jake Jacobs. Coping with weather unpredictability by planning ahead. Demonstrating Success: Corn Hybrid Trials By Kirsten Workman. 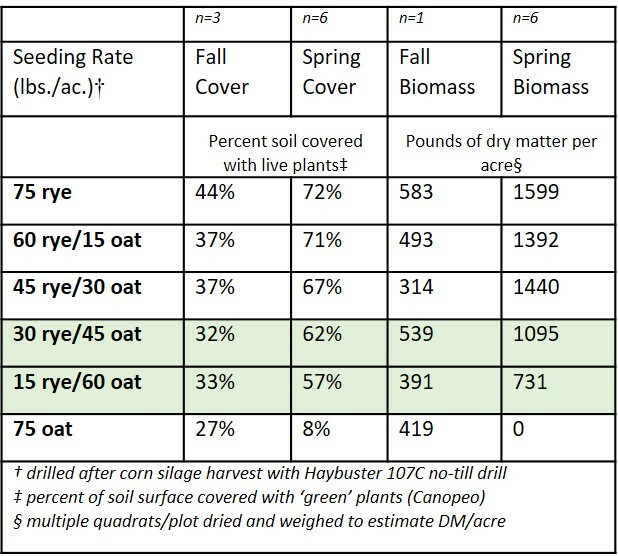 Corn hybrid trials were a successful way to see what shorter season hybrids might be paired with cover crop adoption. 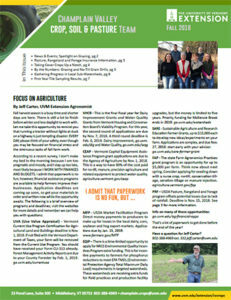 Newsletter Feature – Grazing as a New Management Practice By Cheryl Cesario. The process of adopting grazing management seen through one farmer’s experience. Also – new grazing class to teach you how to develop a grazing plan! Managing Slugs Begins in the Fall By Rico Balzano. Making decisions now to manage slugs next year. Helping Farmers Adapt to a Changing Landscape By Nate Severy. 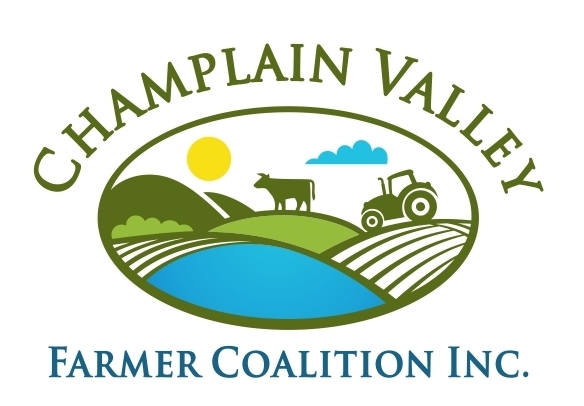 UVM Extension and the Champlain Valley Farmer Coalition are working together to provide farmers with valuable insights for adaptive management. View our pdf to read more on any of these topics! TWO (2) Water Quality Training Credits for farmers! This event is one in a series of events happening for Clean Water Week. Free lunch at 12:30 generously sponsored by Seedway. Come join the fun! Join the UVM Extension’s Champlain Valley Crop, Soil & Pasture Team and local seed suppliers in the field to see our corn hybrid demonstration, comparing shorter season corn varieties (85-98 day). 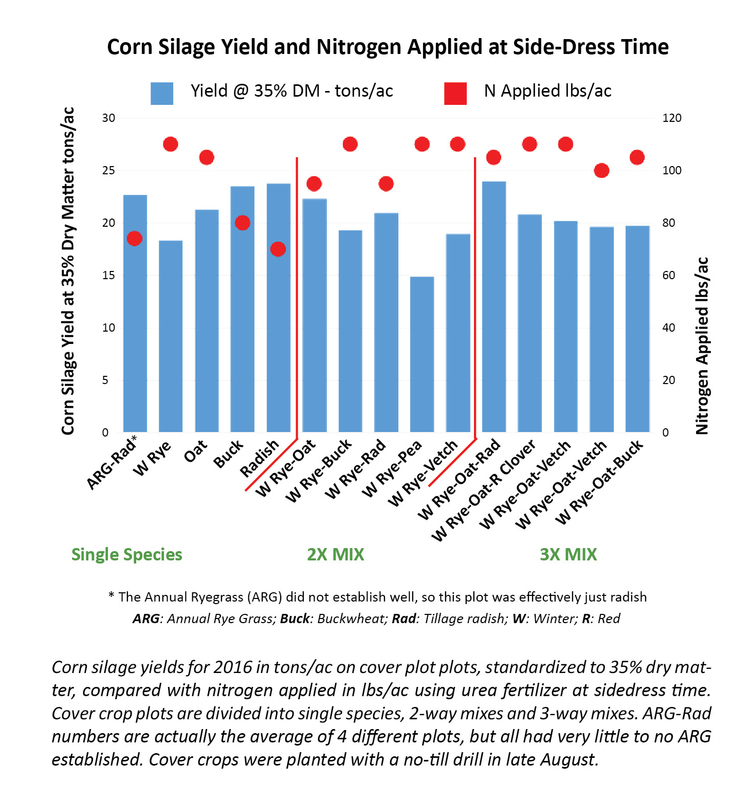 Can we accomplish high yielding corn and timely cover crop seeding? Come check it out. We’ll take a trip down the road and check out some long season hybrids too! 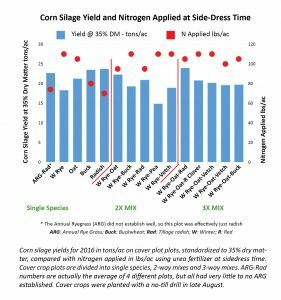 Research in northern VT has suggested that variety, as opposed to just day length, is important in determining corn yield. To this end, we have planted 21 corn hybrids ranging from 85 DRM to 98 DRM to assess yield and quality. The objective is to test varieties on our soils and find optimum day length so that there is more time in the fall for cover crop seeding and establishment without sacrificing yield. We will also have the opportunity after lunch to look at some longer day hybrids in a different field and take a look at this farms novel approach to no-till, manure application and cover cropping. on page 4.) This looks very different, and may be a bit scary, compared to a bare soil field that was plowed and harrowed multiple times. “GOT RYE? WE DO!” ROLLING-CRIMPING WINTER RYE OVER 5 FEET TALL! The rye provides a nice mulch to conserve soil moisture for a dry August and saves soil. Like other practices, it takes a new mind-set to adapt and succeed when working with these fine-textured clay soils since cover crops influence the dynamics of insect and weed pressure on the crop. Let’s see how this turns out. We have seen some great success with no-till on clay and we have also seen some disasters. Cautious, yet steady, is how you need to adopt these new farming practices for success. We are also moving into a new set of projects this year and stretching our limits with agronomy – “the science and technology of producing and using plants for food, fuel, fiber, and land reclamation.” In coordination with partners, we are looking at the economics of no-till and cover crop systems; soil amendments such as humates, mycorrhizae, gypsum and liming materials for soil productivity; testing manure slot-injection with a drag hose into hay fields; testing P levels in streams and tile outlets; developing pasture planning and grazing classes; and evaluating a new P-Index for Vermont. We are here to help, let us know how these new farming ideas work for you. Have a question for Jeff Carter? 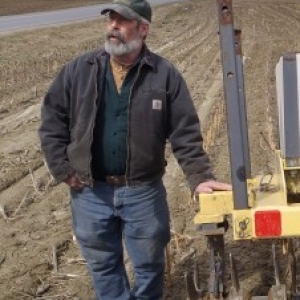 SPRING BUS TOUR SENSATION; CAN ROLLING-CRIMPING HELP MANAGE COVER CROPS? teamed up to host a bus tour to six farms throughout Addison and Chittenden Counties highlighting spring conservation practices. The tour showcased manure injection, cover crop and no-till systems, pasture management, and nutrient management on dairy and vegetable farms. It was a long, information-packed day. One of the most amazing things was that all of the host farms had the same general message: they care about our environment, and are working hard, taking risks, and investing a lot of time and money to try to be the best farmers they can. One tour participant commented that they were flooded with information and hadn’t realized just how much farmers are standing up and taking a leadership role to protect water quality. 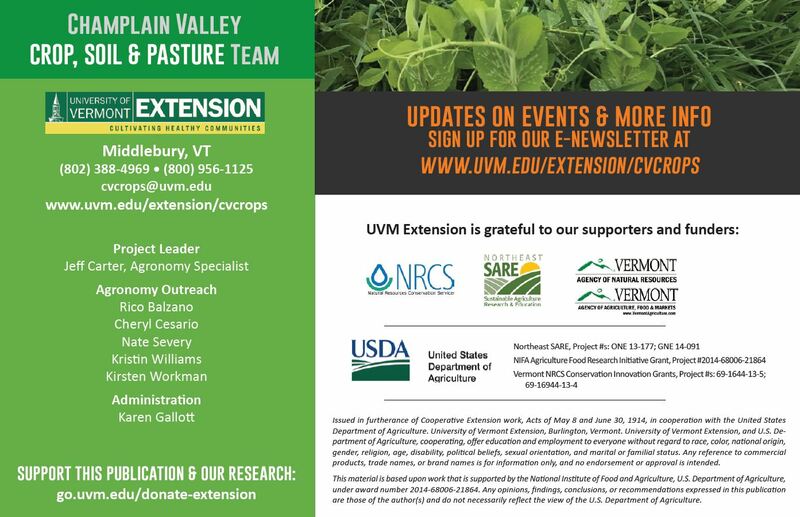 The event was a great example of how farmer organizations and UVM Extension can work together to support the agricultural backbone of Vermont. mulching effect of the cover crop and, with correct furrow adjustment, should address issues of light penetration to young seedlings. mounted roller-crimper. This is actually a shield and two disks on the front of each planter unit, as opposed to a single roller-crimper. These attachments are angled to part the cover crop material and roll it away from the furrow where the corn is planted. No-till corn planted into tall winter rye cover crop in Addison County clay soil using the UVM planter with Dawn roller-crimper attachments on the front of each planter unit. We will monitor the fields over the next few months, observing changes in water infiltration/retention and drought stress response, weed and pest levels, nitrogen availability, and corn yield. Thanks to Jeff Sanders and the participating farmers! We look forward to sharing results and to future trials. Farmers are planting cover crops at a rapidly increasing rate across Vermont – and for good reasons. The water quality and soil health benefits of this farming practice are undeniable. However, a farmer who manages that cover crop in a spring like this one will attest to the added complexity cover crops bring to the challenges of growing annual crops in Vermont. crop, and then implement a plan to accomplish that goal. The main goal is usually to reduce erosion and nutrient loss. However, are you also trying to reduce weed pressure, decrease nitrogen applications for the subsequent crop? Will you be interseeding into a standing crop? Do you want to maximize spring biomass either to harvest it as forage or to use a rollercrimper device? Or, maybe you hope to minimize spring biomass to ease spring field management without sacrificing erosion control and nutrient retention. crops, especially on heavier soils. well at providing at least 30% ground cover to protect from erosion in the fall. 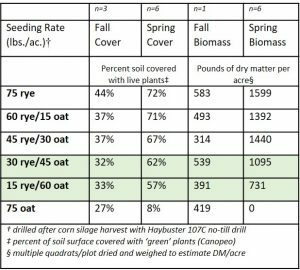 With the exception of the all-oat plots, all combinations increased soil cover and biomass from fall to spring. 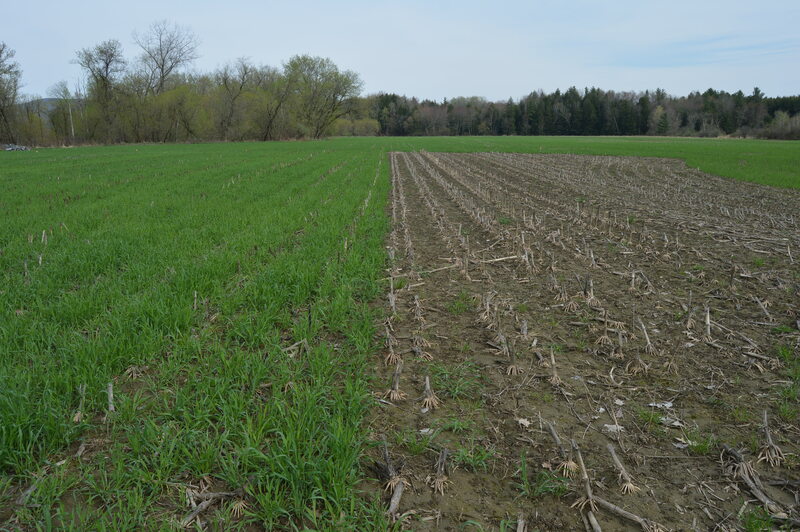 Winter rye (left) and winter-killed oat (right) cover crop plots at Pouliot Farm in Essex on May 1, 2017. 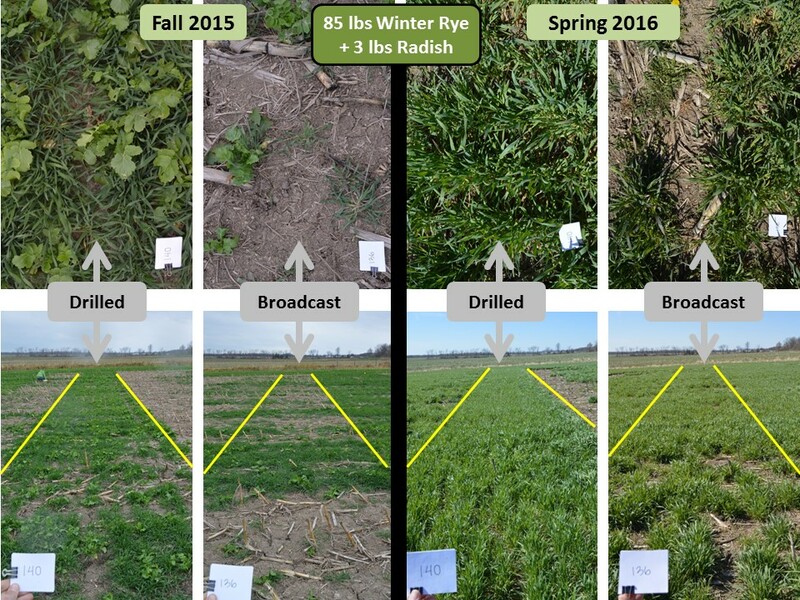 This trial supported previous observations that winter rye – planted with a grain drill – provides similarly high biomass in the spring at different seeding rates, down to 45 pounds per acre. The two combinations that seemed to maximize fall performance and spring soil coverage while minimizing spring biomass were 30 pounds of rye with 45 pounds of oats, and 15 pounds of rye with 60 pounds of oats. The lowest rate of rye is probably not an advisable rate on steep ground, but it should provide enough soil coverage on flat ground. Our aim is to help farmers identify the pros and cons of different methods of cover cropping, and evaluate which methods accomplish particular goals. 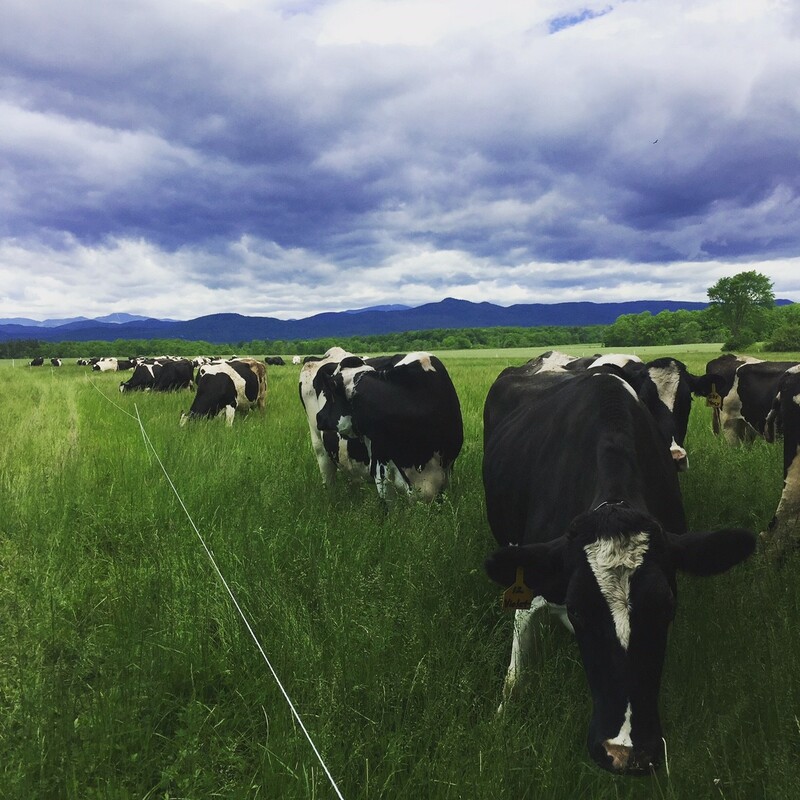 We are moving beyond the basics in Vermont, and it is important to utilize this important conservation tool in a way that benefits not only the watershed, but also your farm. Cover and biomass for winter rye and oat cover crops. Spring Pasture Walk. This Friday, May 5, Addison, VT. For more information and rsvp contact Cheryl Cesario (802-388-4969 ext. 346). Cover Crops as Forage Crops. Next Monday, May 8, Cornwall, VT, 11:00-12:00 pm. Meet at the Champlain Valley Motorsports parking lot. 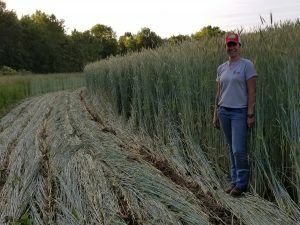 Coordinated with the Champlain Valley Farmer Coalition, this informal “crop patrol” for farmers will explore growing and harvesting a winter rye cover crop for forage. 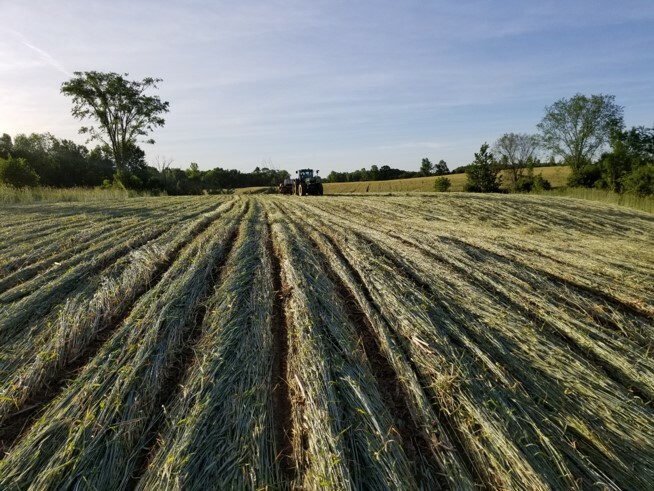 We will explore how would you manage a cover crop to maximize forage yield, fit into an annual crop system, and utilize for grazing before a summer crop. For more information contact Nate (802-388-4969 ext. 348). Dairy Science and Sanitation. May 10-11, 8:30 am-5 pm, UVM, Burlington, VT. Hosted by the UVM Extension and Cornell University. More information can be found here. The Youth Agricultural Individual Development Account (IDA) Program, a collaboration of University of Vermont (UVM) Extension 4-H and the UVM Center for Sustainable Agriculture, has extended its deadline to May 15 for applications for its next program cycle. The free one-year program helps young farmers, ages 14 to 21, acquire the necessary financial skills and business assets to operate their own agricultural business. More info/applications here. Management Intensive Grazing for the Diversified Farm. May 21, 10:00 am-3:30 pm. Randolph, VT. More information can be found here. The New RAP rules are now in effect, including vegetative buffer requirements. If you are plowing and/or planting annual crops, you should be informed of buffer rules. To see the entire list of RAP rule effective dates, see this link. Questions should be directed to VAAFM. You can also contact us if you’d like help on your farm determining how to make compliance work for your operation. 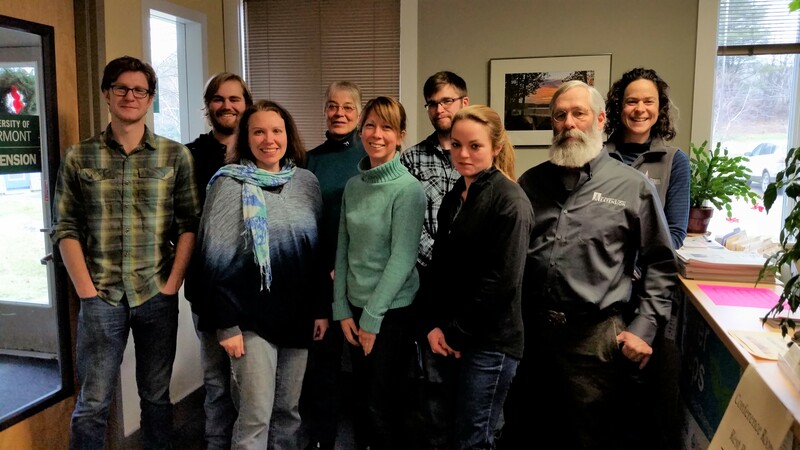 The Agricultural Business / Farm Viability Program, through UVM Extension has ongoing funding for water quality business analysis, to help farmers analyze options for meeting conservation and regulatory compliance goals. Analysis will include financial planning, strategic planning and coordination with related agencies. For more information or to sign up, contact Mark Canella (1-866-860-1383, toll free in VT).